For my card, I went the build your own route! I used my alpha stamps from the set Flashy Letters to create a completely custom card. I stamped the letters first and then just filled in with various colored blooms and leaves. For some of the flowers I stamped off first to get a softer look. Two of the blooms are fussy cut and popped up and I just love how it looks! Thanks so much for stopping in today! Click over to the rest of the team to see more Water Blooms inspiration. Eek! Custom is awesome!! Love that part of the sentiment is on the flower and you popped it up!! Wow! So so cool! And totally awesome that the flowers were the O's too!! So cool! This is gorgeous, JJ! I love the mix of stamps and the way parts of the letters are popped up! This is gorgeous! And I love this hybrid version of the Bolton technique, seriously gorgeous! Totally love it, JJ. I love your use of the letters blended with the flowers. Colors are so soft yet the green gives it some brightness at the same time. Gosh this is so beautiful! Love the design and colors! OH WOW! This is gorgeous! I LOVE the stamping and then making it 3D-- WOWOWZA! Beautiful card, JJ! As always....... YOU ROCK! Gorgeous! 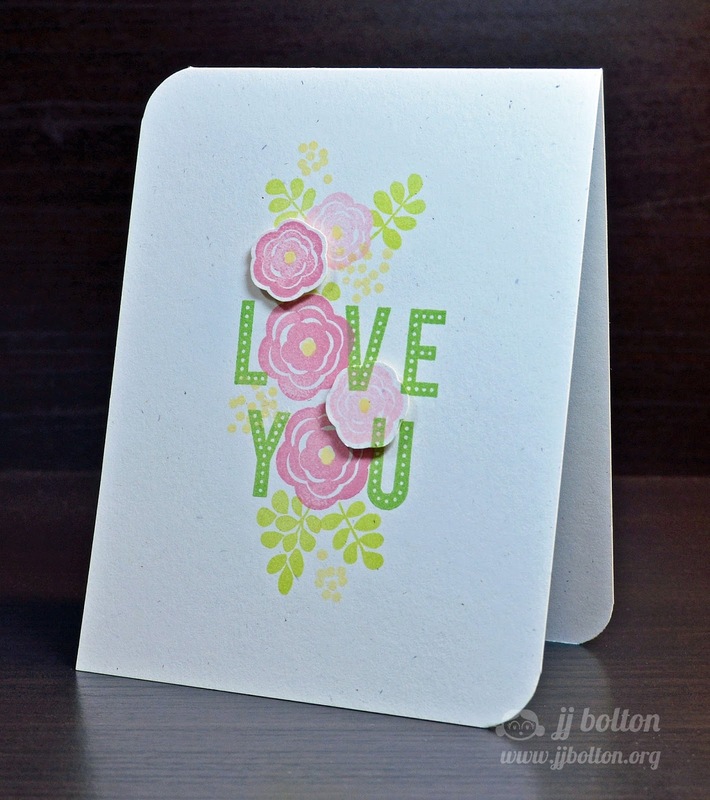 Love how you incorporated the letters with the blooms! 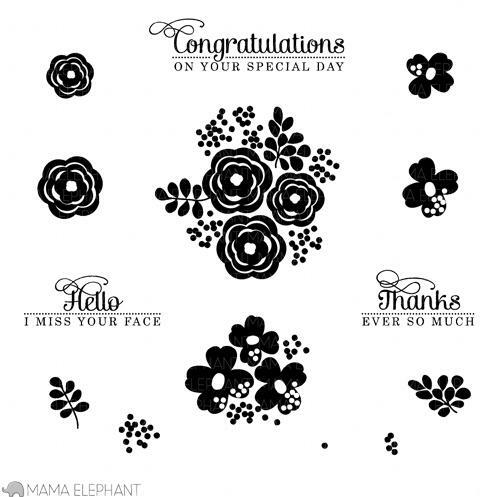 FABULOUS card JJ - gorgeous stamps! 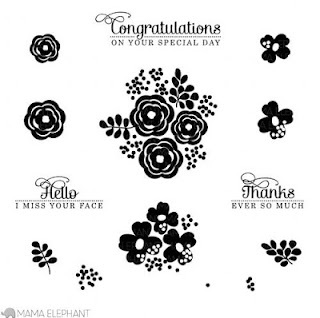 Love this so much for not being a typical flowers-plus-sentiment card!! Your V and U on the flower are just perfect!!! 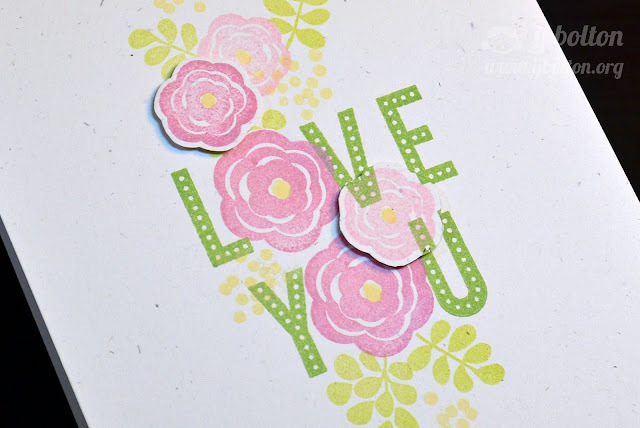 super sweet...love the stamping and the colors! LOVE this card, and the use of flowers as "O"s! Beautiful, JJ!! Love seeing your cards with this technique! Yummy colors, too! Love your take on these blooms - my first thought when I saw this set was all victorian and romantic - you made them so fun and fresh! Love the stamping on the letter too! I have to ask... how did you manage to align all of that beautiful stamping RIGHT IN THE MIDDLE? is there a trick I should learn? LOVE this card, btw. SImple and lovely.